EXTERNAL Affairs Minister Yashwant Sinha is right. The involvement of Pakistani scientist Qadeer Khan in nuclear proliferation is not an internal matter of that country. It requires international attention. India as a next-door neighbour is bound to feel concerned. CONGRESS president Sonia Gandhi's “thanksgiving” lunch for leaders of 13 parties on the last day of the 13th Lok Sabha reveals more than the fact that she, like Prime Minister Atal Bihari Vajpayee, is not superstitious about the number. DOCTORS are searching for it, if you have it; you could be singled out for special treatment. In case you pass it on, you will face the consequences-the whole world is seized of the situation and it is being monitored very closely. AS a result of secret investigation and several months of news management – or media trial as the opponents called it – the Musharraf regime brought Dr. A. Q. Khan, an obviously crestfallen man, before TV cameras for confessing his transgressions and asking for pardon. PRIME Minister Atal Bihari Vajpayee’s dream project — Delhi-Hanoi rail link connecting India with five South-East Asian countries — may soon become a reality. The Rail India Technical Services has just started a technical feasibility study on the 315-km-long “missing link” between India and Myanmar. WHEN Dr S.C. Pandey had a massive heart attack, all that his wife needed to do was to pick up the telephone and call the doctor who was just 400 metres away from their home. But the telephone remained dead as usual, forcing Mrs Pandey to leave her husband alone and walk the distance to get the doctor. EXTERNAL Affairs Minister Yashwant Sinha is right. The involvement of Pakistani scientist Qadeer Khan in nuclear proliferation is not an internal matter of that country. It requires international attention. India as a next-door neighbour is bound to feel concerned. That Mr Sinha did not go beyond what he said was obviously because he wanted to avoid anything that could impact the ongoing efforts to improve India’s relations with Pakistan. Dr Khan’s confession that he has provided nuclear secrets to Iran, Libya and North Korea is a serious matter which the world ought not ignore. It is immaterial whether an individual functionary or the Government of Pakistan has indulged in this errant conduct. As is well known, Pakistan’s nuclear facilities have been under the exclusive control and command of the Army. No one will believe General Musharraf’s claim that the military bosses were not aware of the alarming happenings. Only last week Dr Khan had told his interrogators that what he did had the sanction of two former Army chiefs — Gen Aslam Beg and Gen Jehangir Karamat. Later he mentioned General Musharraf’s name also. Dr Khan’s blatant answers during his interrogation— which acquired the characteristics of a farce — must have been among the reasons that led to his suddenly asking for the President’s pardon and General Musharraf immediately accepting his plea for mercy. The matter, however, demands an enquiry by the global community, particularly the International Atomic Energy Agency. A development as serious as nuclear proliferation cannot be overlooked because it can threaten world security. There is also the danger that Pakistan’s nuclear knowhow and weapons can fall into the hands of extremists, whom President Musharraf is finding it difficult to control. The global community is concerned about the proliferation tendencies of Pakistan which have come out into the open. This is evident from General Musharraf’s own remarks that all this could lead to international supervision of Pakistan’s nuclear programme. America, which is now feeling concerned about Pakistan’s proliferating activities, ought to have known it better. It is now paying the price for looking the other way. The US may be inclined to exonerate President Musharraf of the blame, but it cannot allow to rest the matter at this point. CONGRESS president Sonia Gandhi's “thanksgiving” lunch for leaders of 13 parties on the last day of the 13th Lok Sabha reveals more than the fact that she, like Prime Minister Atal Bihari Vajpayee, is not superstitious about the number. The gathering of 28 representatives, including former Prime Ministers Chandra Shekhar and H D Deve Gowda, one-time arch-foe DMK's T R Baalu and NCP boss Sharad Pawar, was as disparate as the menu was diverse. Yet, in this pre-poll season when parties are more about alliances and less about food, this shows that an anti-NDA formation is beginning to take shape under the leadership of Mrs Gandhi. The BJP, which has run the country's first successful coalition at the Centre for a full term and more, cannot be complacent about the nature of the Opposition it has to reckon with. There is a unity of purpose driving this emerging front and that is to defeat the BJP. The fact that those caught between the political poles, such as the Samajwadi Party and the Bahujan Samaj Party, turned up for the luncheon is a sign that everyone is hedging his/her bets and that electoral adjustments are far from cohesive and settled. The potential for discord in the coming together of incompatible parties is manifest in the DMK and the NCP joining hands with the Congress. The Congress has pilloried the DMK for almost 20 years, implicated it along with the LTTE in Rajiv Gandhi's assassination and forced its exit from the United Front government. The DMK is unlikely to have forgotten that Mr Chandra Shekhar, as Prime Minister, dismissed Mr Karunanidhi's ministry in 1990 at the behest of the Congress. Mr Pawar, till recently, had been better disposed towards the NDA than the Congress. However, the Congress is not alone in striking opportunistic electoral alliances. The BJP too has embraced the prodigal, Mr Kalyan Singh, on his return to the fold and cosied up to the unpredictable Ms Jayalalithaa though the AIADMK had pulled the rug from under Mr Vajpayee's previous coalition government. Far from looking at a post-poll scenario, the BJP and the Congress need to ponder whether their allies would pull together through the sticky stage of seat-sharing to the voting day. That would be the first test. DOCTORS are searching for it, if you have it; you could be singled out for special treatment. In case you pass it on, you will face the consequences-the whole world is seized of the situation and it is being monitored very closely. Birds have it, bees can take it to places unknown and humans who get it are doomed. At any airport or a border, you have individuals wearing N95 masks and florescent suits, remarkably reminiscent of bio-warfare suits as seen in various Hollywood movies. Ready they are to pounce on anyone who has it. What is it that they are looking so hard for? It essentially consists of a core of RNA or DNA surrounded by a protein coat. It is typically not considered a living organism since it is unable to replicate without a host cell. It is a virus - call it by whatever name you want to give it, SARS or bird flu. And imagine, it is technically not even considered to be a living organism! However, it is definitely dominating the mindscape of the living. Since this "simple submicroscopic parasite" is often the cause of disease, you have barriers to stop "contaminated" humans. Sociologists point out even without the physical dimension, the damage is already done since the virus corrupts the intellectual and moral perceptions — it poisons the mind and the soul. As if the biological threat was not enough, even the machines that purport to mimic the human brain have started getting infected with this. Just open your e-mail box and you may unwittingly download MyDoom virus that has clogged millions of computers worldwide. Concerned security personnel rue that the Internet is unregulated and thus there are no airport-like checks that can be used to prevent the unauthorised entry of such damaging bits of code. AS a result of secret investigation and several months of news management – or media trial as the opponents called it – the Musharraf regime brought Dr. A. Q. Khan, an obviously crestfallen man, before TV cameras for confessing his transgressions and asking for pardon. His misdemeanours included selling state secrets – nuclear knowhow and uranium enrichment technology, blueprints and all – for personal gain to Iran, Libya and North Korea. A day earlier he was shown presenting a mercy petition to President Pervez Musharraf, who later accepted it and pardoned him. General Musharraf’s purpose was to draw a line under the long-running affair. He was in a hurry to close this highly embarrassing chapter that had been sprung open when Iran and Libya blew the lid over what was an international ring of dealers secretly selling nuclear knowhow and technology. Iran provided full information on the state of its nuclear programme to the UN’s International Atomic Energy Agency. The latter wrote to Pakistan, giving relevant information that included six Pakistani names who had helped Iran in its uranium enrichment programme. Later the Libyan dictator’s son disclosed that his father had bought the nuclear knowhow and technology for $ 50 million from what had become an international supermarket linked to Dr A.Q. Khan. Through leaked stories, the Pakistan government had emphasised the point that all the proliferatory activities of these eight individuals were motivated by personal greed. The government or the Army played no part in this. Without giving the necessary details, the riches of Dr Khan were played up. The only details that were mentioned were that he owned a lot of real estate assets in Pakistan, Dubai and, of all the places, Timbuktu plus his foreign accounts bulging with crores of dollars. The quick disposal of the mercy petition and granting of the pardon, all within 24 hours, had all the marks of a secret understanding with Dr Khan in which the latter took full responsibility for the actions of all the “accused” and exonerated from blame all those whose job it was to ensure that Pakistan’s nuclear knowledge and technology were not given to unauthorised persons or states. Instead of the drawn line under the sordid affair being clear and definitive, it has, in fact, been received with skepticism at home and abroad. Major parties, the PPP and the PML (Nawaz), have accused General Musharraf of using Dr Khan and other scientists as scapegoats to save his own and the Army’s skin. His veritable ally, the religious parties’ alliance called the MMA, gave a call for a strike on Friday which did see the shutting down of most businesses and the disruption of urban traffic and educational activities in most parts of the country. Incidentally, General Musharraf also attacked the national Press for doubting the official version and noted the Army’s long and sustained failure to check this haemorrhaging of nuclear secrets and technology from the A.Q. Khan Research Laboratories. It was much like a potentate of yore shooting the messenger carrying bad news. Among the foreigners, a distinction has to be made: the US, the UK and China, which need General Musharraf’s cooperation badly, have accepted the official Pakistani version at face value. But the Western Press falls into the second category of skeptics. It has uniformly found this story questionable. No one seems to be able to swallow the proposition that for at least 12 years and more the Pakistan Army with its two ubiquitous intelligence agencies saw nothing or heard nothing about the goings-on at KRL or, even more strangely, they knew nothing of Dr Khan’s four big houses in Islamabad, his interest in two three-star hotels and his distribution of crores of rupees to various institutes and universities. If it is true, how incompetent and negligent they could get? The Western Press uses the term “whitewash” all too frequently. Who can be surprised at UN Secretary-General Kofi Annan’s calling this pardon “odd”, while appreciating the difficult situation General Musharraf is facing. As for civil society and the academia in the West, they are sure to call for a thoroughly impartial probe. There is understandable trepidation in official Pakistan because world opinion is uniformly against nuclear proliferation and here is a proven case of proliferation. But the way the nuclear black market was functioning, who could guarantee that the next buyer would not be a terrorist outfit like Al-Qaeda? This possibility will keep the minds concentrated all round the globe. General Musharraf too has his own defence. He has himself admitted to regarding Dr A.Q. Khan as a “larger-than-life national hero”. The doctor is certainly venerated by a very large number of people for his “great achievement”, giving Pakistan the means to look India in the eye and damn the methods he employed. Even now many know of his obscene opulence that is downplayed by his worshippers. Nevertheless, he is being promoted and articulated by a large posse of paid publicists. But the full disclosure about what he did is sure to cut him down to size. The noisy and shallow support that Dr Khan has will wear out all too soon if all the facts become known. But for now, General Musharraf has a tough task before him. Talking of the fallout within South Asia, notice can be taken of the small anti-bomb lobby in Pakistan that is not without influence. It wants all the facts surrounding this sordid affair to be known. It will welcome a UN investigation. Nuclear proliferation is certainly an issue that concerns all and that makes the UN a proper institution to conduct the probe. But one issue is relevant: India-Pakistan rivalry, technically over Kashmir, though virtually sui generis. By virtue of possessing nuclear deterrents they might never be able to genuinely befriend each other and settle down to good neighbourly cooperation. The Indian reaction to these disclosures seems to smack of glee and tending to proceed to point-scoring. That can only further complicate the complex situation in South Asia. The people of Pakistan and India do not seem to realise the terrible mischief the mere presence of nuclear weapons plays. These are Doomsday weapons against which nobody, not even the US, has any defence. They must not be used and this needs to be ensured. So long as they sit in the armouries of India, no General in Pakistan can trust India that it will not incinerate one or more cities. Similarly, so long as Pakistan has the bomb, no Indian can truly trust Pakistan’s pacifist declarations. The logic of nuclear deterrence, more so if the weapons are directly aimed at each other, is that they are constantly updated, made more murderous and increased in number; all governments do so all the time. This lobby holds that a nuclear restraint regime, now on the agenda, or CBMs, is nearly an oxymoron. The attention was better shifted from all these fine-sounding distractions to the real task that is not impossible: getting rid of these weapons altogether. Few non-Indians seem to see any rationale for the Indian nukes except to contain the Pakistanis – whose nukes are openly aimed at India. The 2002 military confrontation showed the total inability, for political, moral or military reasons, of both sides to draw their atomic swords. Both can do very well without these nukes. China in the Indian narrative as the main threat does not convince either all Indians or outsiders. The two South Asian nations, by becoming non-nuclear, will do a favour to themselves. Rahul said he was disturbed by loud music played on a car stereo as early as at six in the morning. “Was it a white car?” asked Nitin. “Yes” Rahul replied. “With registration mark 1069?” queried Nitin. “Yes, something like that!” Rahul confirmed. “Oh Yaar! It could be none else but my idiot car-driver,” said Nitin. “Do you know what happened to the cricket match?” Nitin changed the topic. Rahul said with a genuine sense of loss,” No yaar! The morning cacophony disturbed me so much that it slipped out of my head.” “O.K.! Was this man a lean one and bent a little?” Nitin asked again referring to the driver. “Yes” Rahul confirmed. “Oh yaar, it can be nobody else than my lowly car-driver!” said Nitin. “How was your visit to the Auto-Expo?” Nitin again digressed. “Disgusting. I was expecting something like a Sachin Ferrari being there for a free-ride.” Replied Rahul when Nitin sought afresh: “Did the fellow listening to the devotional songs wear a brown jacket?” Rahul hummed in the affirmative. “I can have a bet now; this unscrupulous fellow was certainly my car-driver,” declared Nitin. I began to lose my cool. Even the barber pointed out perspiration on my forehead. I told him not to mind it since I was a bit hyper-tensive. But I had decided in my heart of hearts that if the boys continued with their prattle and the enigmatic car-driver anymore, I wouldn’t tolerate it despite being in an Indian hair-cutting saloon where freedom of expression is doubly guaranteed. More than what the Constitution does. Rahul now queried Nitin on the latter’s family’s stay in their locality. “No. We will have to move to Gurgaon. Yaar my Dad is retiring naa.” Nitin said with a sense of remorse. Rahul again chipped in,” You may not then enjoy the perks available to you, as they are available to your dad now?” “Certainly not. But I’ll get rid of this stupid car-driver who has been shadowing me like a spy, since I will then stay in Delhi as a PG (paying guest)!” said Nitin. At this juncture a lean and weather-beaten man entered and asked Nitin, “Aren’t you done as yet son?” Nitin looked at the man and blurted: “No Dad. But couldn’t you have waited and had patience with yourself? I am 23 now.” The man swallowed the reprimand and sunk in the bench. Rahul turned his face towards the man and said, “Oh sorry uncle! We had been talking about you only.” There was no comment from Nitin’s side. And what had they been talking about Nitin’s father? I thought I should tell the man. But something held me back. A fatherly feeling? Or being reminded how the youngsters threw out of the running train a boy called Manish just a few days back? I don’t know. Ha(i)rried, I hurried homeward. PRIME Minister Atal Bihari Vajpayee’s dream project — Delhi-Hanoi rail link connecting India with five South-East Asian countries — may soon become a reality. The Rail India Technical Services (RITES) has just started a technical feasibility study on the 315-km-long “missing link” between India and Myanmar. Once operational, Delhi-Hanoi train will traverse through a number of South East Asian countries like Myanmar, Laos, Cambodia and Thailand and terminate in the Vietnamese capital of Hanoi. RITES has been asked to complete the technical feasibility study in 100 days. That is because except for the 315-km-long India-Myanmar “missing link”, a majority of the railway infrastructure for the rest of the proposed rail line already exists. The million dollar question, however, is what will be the findings of RITES’s feasibility study, considering the extremely difficult hill terrain of the “missing link” between Jiriban (Manipur, India) and Kalay (Myanmar). 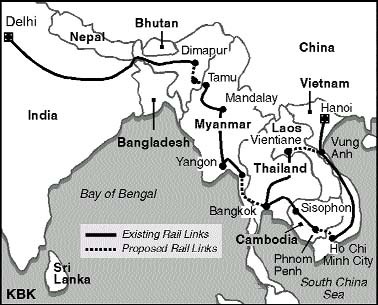 The Delhi-Hanoi rail project is one of the foreign policy corner stones of the Vajpayee government in boosting relations with South-East Asian countries, powerful regional grouping like the Association of South East Asian Countries (ASEAN) and the emerging regional grouping like BIMSTEC, an acronym for Bangladesh, India, Myanmar, Sri Lanka, Thailand Economic Cooperation which has recently taken South Asian countries Nepal and Bhutan also in its fold. The Delhi-Hanoi rail link is not the only transportation mode to ensure South East Asian transnational connectivity. Creating a “short sea shipping grid” is another promising and ambitious mode. The transnational coastal shipping grid will boost trade, tourism and goods movement in the region. Besides, it will facilitate a cheaper and quicker passenger travel in the region. For example, the journey between Port Blair and Phuket (Thailand) will take about 16 hours, Phuket to Chennai 48 hours and Phuket to Colombo 38 hours, sources disclosed. The added bonanza from the Indian point of view, of course, will be rapid development of such far-flung but strategically important areas as the Andaman and Nicobar Islands. The Delhi-Hanoi train and the BIMSTEC coastal shipping grid will dramatically increase tourists’ movement within the BIMSTEC. Right now only 24 per cent of the BIMSTEC population moves intra-region, as compared to 34 percent for ASEAN and a whopping 81 per cent for the European Union. The BIMSTEC was formed in 1997 and its first summit-level meeting was to be held this month only and Prime Minister Vajpayee was to attend it. India’s influence in the region can be gauged by the fact that the regional grouping decided to defer the summit meeting after Mr Vajpayee expressed his inability to attend the meet in view of the political developments at home. India stands to gain diplomatically as well as politically with the BIMSTEC for the following reasons: (i) India does not need SAARC for economic and political reasons in view of the Pakistani intransigence simply because the BIMSTEC is SAARC minus Pakistan. Besides, BIMSTEC has in its fold a rapidly devolving country like Thailand. (ii) This means that India has virtually sprung up a parallel SAARC body and it can do without SAARC, can do without Pakistan’s non-cooperation within SAARC and can actually dictate terms in the region. (iii) ASEAN has already demonstrated to the region, if not the world, that it can influence the economics and politics of the region in a big way. The BIMSTEC can be yet another role model. Though Nepal and Bhutan have just been admitted to the BIMSTEC, it has been decided that the outfit continues to be known as BIMSTEC only, despite the fact that it will no longer be a correct acronym. Transportation is not the only issue which the governments of the region have in mind to promote intra-region relations. The BIMSTEC has identified six key areas for enhancing cooperation: (i) transport and communication (ii) trade and industry (iii) tourism (iv) technology (v) energy and (vi) fisheries. On all these issues, sectoral meetings have taken place. A surprising point here is that just when the BIMSTEC countries thought they had a commonality to share — Buddhism — there was a nagging feeling that one country would surely not be interested in Buddhism: Bangladesh. They discovered to their amazement that Bangladesh too was deeply interested in Buddhism and the Muslim country boasted of many Buddhist sites. This may well be the new find: the cultural bonding. But there are other cementing factors among BIMSTEC like the energy sector. The new entrants — Nepal and Bhutan — have massive energy resources. This potential is yet to be tapped. WHEN Dr S.C. Pandey had a massive heart attack, all that his wife needed to do was to pick up the telephone and call the doctor who was just 400 metres away from their home. But the telephone remained dead as usual, forcing Mrs Pandey to leave her husband alone and walk the distance to get the doctor. The delay so caused proved too costly and Dr Pandey breathed his last before a life-saving injection could be administered. In hundreds and thousands of homes around the country where the elderly live alone, the telephone is an essential lifeline. They depend on it to communicate with their children who may be living elsewhere. Even more important, they need the telephone to contact a doctor in a medical emergency. The elderly are also prone to falling in bathrooms and suffering fractures. So a working telephone is an absolute necessity, whether to call an ambulance or even the fire brigade. Given the fact that they are easy targets for criminals, the telephone comes in handy to call the police too in an emergency. Since these homes do not have mobile phones, they are fully dependent on landlines. The service provider, be it BSNL or MTNL or a private company, therefore has to be extremely sensitive to these factors, put the telephone numbers of such people on their VVIP list and ensure that their telephones always remain in working order. If their telephone goes out of order due to some unavoidable reason, then the service provider should give them a mobile phone till the fault is rectified and the service restored. And even if by chance their telephone is temporarily disconnected for non-payment of bills, they should still have the facility of making calls to emergency numbers. This is the least that can be done to make life easier for elderly citizens. I would like the TRAI and the Ministry of Communications to ensure that the elderly do not suffer the consequences of negligent service provided by an insensitive company, as happened in the case of Dr Pandey. What was most distressing in the case of Dr Pandey was that from the time his telephone was installed in 1993 till his death in 1996 , he waged a constant battle with the department to get his telephone working. It would go out of order frequently and for long periods and given his heart condition, this worried him. Since his calls to 194 either went unanswered or brought no relief, he started writing letters. So from 1993 to 1996, he wrote at least 30 letters to different functionaries in the telephone department, bringing to their notice his health condition and the need for rectifying the telephone, but without any success. The last letter that he wrote before his death was also to the same department and on the same subject. And his worst fears came true. His doctor told Mrs Pandey that if only she had called him on the telephone, Dr Pandey’s life could well have been saved. Upset by the turn of events, Mrs Pandey filed a complaint before the consumer court against the telephone department . The apex consumer court’s response to this case should send a warning signal to all service providers. The recently amended provisions of the Consumer Protection Act now give the consumer courts the power to award punitive damages. And in this case, the National Consumer Disputes Redressal Commission said that this was a fit case for such an award. It therefore enhanced the compensation of Rs 50,000 awarded by the Lucknow State Consumer Disputes Redressal Commission to Rs 75,000 (Smt Kusum Pandey vs Union of India and others, FA NO 135 of 2001). May all the beings see me as a friend; may I see all the things as a friend. I salute Him who is generous, who is ever devoted to Shri Rama, whose deeds are great, who appears with mace to his enemies, who is ever serene in attitude, the destroyer of darkness, and whose body is mighty. at the sixty and eighty places of pilgrimage. it is for you to swelter at the task.